Last Friday we packed our campervan and drove over 3 hours to arrive to a tiny village in the mountains of Asturias. By the time we got to the spot where we had planned to spend the night it was freezing so we warmed up the food, got the bed ready, turned the heating on and fell asleep immediately. We had set up our alarms for 7am, but since it was still dark we decided to sleep in for a bit and got up an hour later! We still had another hour to arrive to Valle del Lago, the town where we would park the car and start our hike. This town is 1200m above the sea level, so we were expecting there would be snow in the mountains. To our surprise, the path to the lake was also covered in snow and ice so it wasn’t easy to walk, and suddenly those 12kms felt like a lot of hardwork. But when we arrived to the lake, it was totally worth it. We decided to eat lunch there and walk on the frozen lake for a bit before walking back to the car and head to the coast where we tried to catch the last glimpse of the sunset over at the lighthouse of Cabo de Vidio. Unfortunately, we were not able to find a nice spot to park the van and spend the night near the sea (apparently the law in Asturias says that you can’t “camp” within 500metres to the sea). So we went to a not so exciting rest area in the highway and spent the night there. The following morning, we decided to get up early and try to see the sunrise over at “Playa del Silencio”, one of my favorite spots in the area. 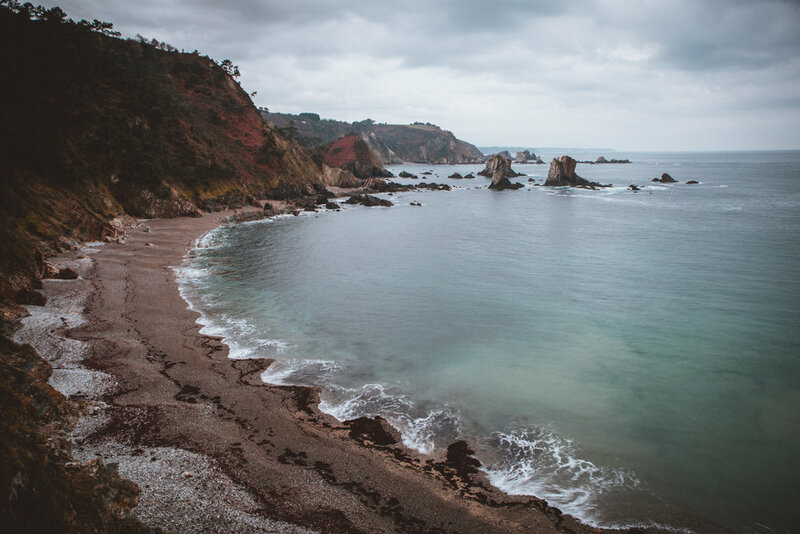 We weren’t very lucky because it was cloudy but we still managed to get a few shots before going to Cudillero for a nice breakfast. There we found a little café where we got lots of warm coffee for our long drive back home. It was a great weekend! I love quick trips like these. Can’t wait to plan more and share the adventures here!